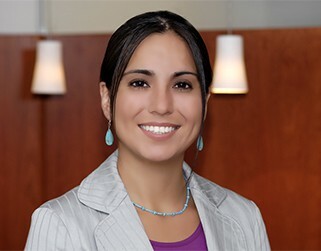 Vanessa L. Ray-Hodge (Pueblo of Acoma) is a Partner in the Albuquerque office of Sonosky, Chambers, Sachse, Endreson & Perry, LLP. Ms. Ray-Hodge works in all areas of the firm’s practice with a special focus in water rights and energy and economic development issues. Ms. Ray-Hodge also regularly advises and represents tribal clients on matters involving land into trust, reservation boundary issues, treaty rights, tribal jurisdiction and regulation, gaming, natural resources development, and infrastructure development. She regularly assists tribes in navigating issues related to federal environmental and regulatory compliance statutes and in working with federal agencies at the local and national level. Prior to rejoining Sonosky, Ms. Ray-Hodge served as the Senior Counselor to Solicitor Hilary Tompkins at the Department of the Interior. At Interior, Ms. Ray-Hodge advised the Solicitor on Indian Affairs issues and was integral in a multitude of decisions. Some of her key efforts included addressing the Supreme Court’s decision in Carcieri v. United States, to continue to take land into trust for tribes, culminating in the Solicitor’s M-Opinion 37029 (March 12, 2014); participating in settling tribal trust lawsuits, including working with the Secretary’s Trust Reform Commission; advising senior Departmental officials on tribal consultation requirements, economic and natural resources development issues in Indian country, including oil and gas operations, and Indian gaming and water rights litigation and settlement issues. Ms. Ray-Hodge attended Wellesley College graduating in 2000 with a major in Anthropology. She went on to Columbia Law School graduating in 2003 with honors as a Harlan Fiske Stone Scholar. Ms. Ray-Hodge is licensed in Oregon, New Mexico and Washington D.C.